Astigmatism is a common eye condition that's easily corrected by eyeglasses or contact lenses. Astigmatism is characterized by an irregular curvature of the cornea. This is one type of refractive error. 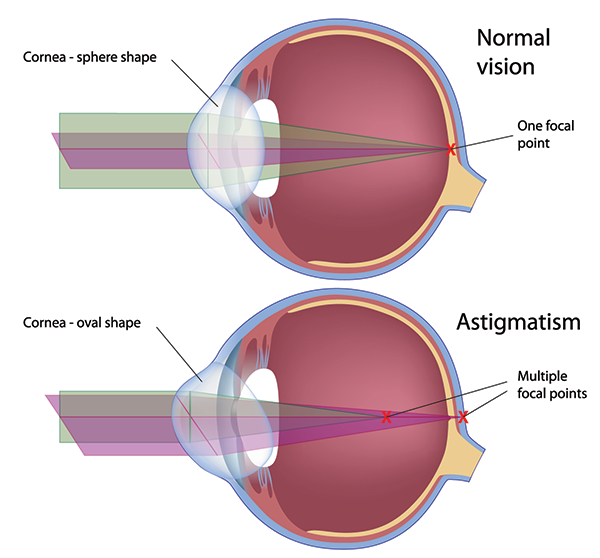 Astigmatism occurs in nearly everybody to some degree. For significant curvature, treatment is required. Your optometrist or ophthalmologist can diagnose astigmatism with a thorough eye exam. Astigmatism may occur with other refractive errors such as myopia (nearsightedness) and hyperopia (farsightedness). Unfortunately, astigmatism often goes undetected in school-age children. Because astigmatism may increase slowly, you should visit your eye care specialist whenever you notice significant changes in your vision.